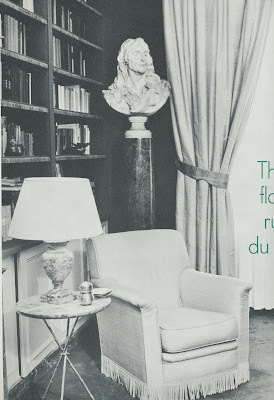 In last week's post on desks, I showed a photo of the c. 1960s Paris apartment of American James H. Douglas, the nephew of Jim Thompson. (Yes, the Jim Thompson of Thai silk fame.) The apartment, decorated with the aid of Georges Geffroy, is quite elegant and sophisticated, fitting for a cosmopolitan young man who was a world traveller. And as one might expect to see in the home of Jim Thompson's nephew, Thai silk abounds. 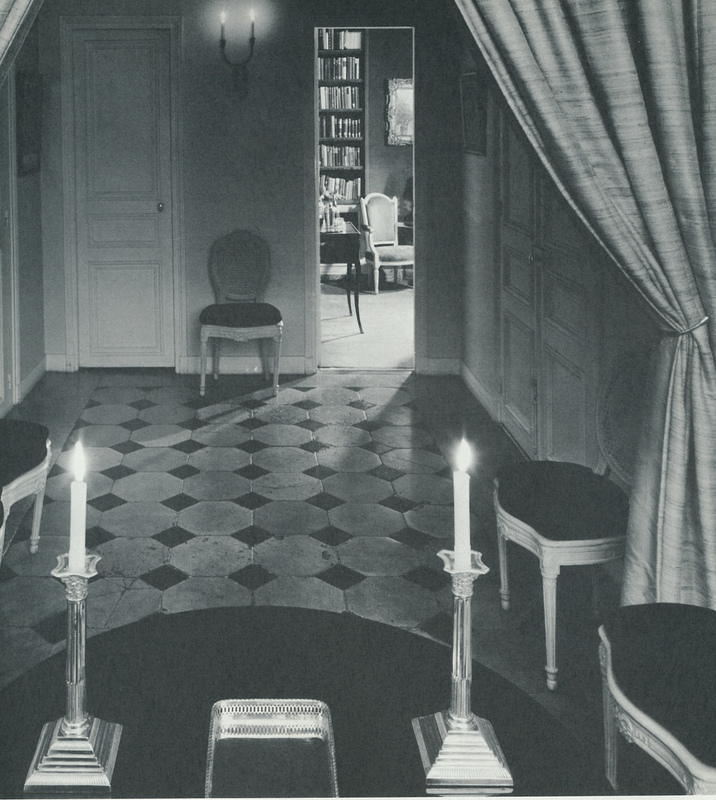 The photos, taken from the book The Best in European Decoration , are unfortunately mostly in black and white. The bright side, though, is that the photo captions are so descriptive that the lack of color is not a handicap. 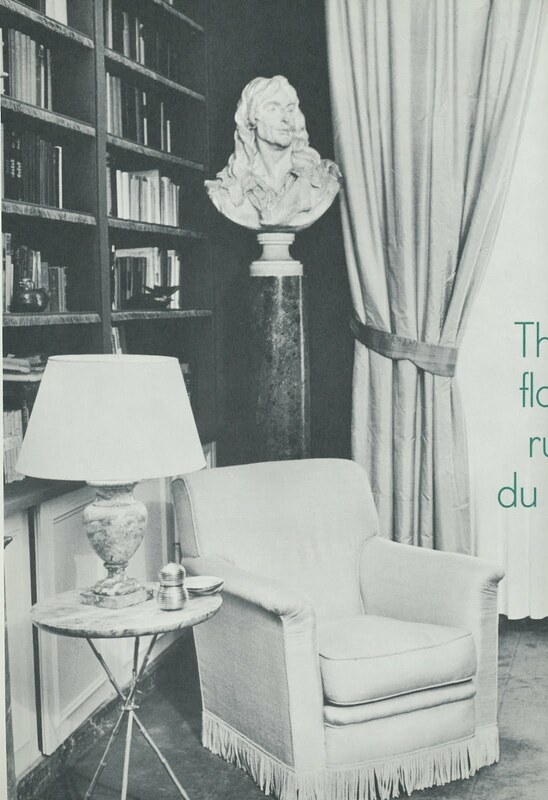 I'm including the book's captions, below, to help you get a better sense of how beautiful this apartment must have been. 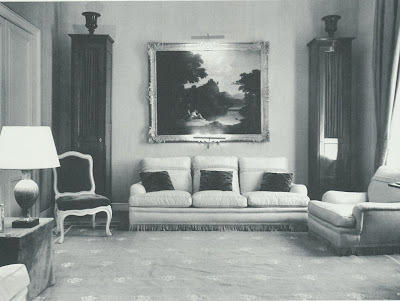 The sitting room-library is seen above and in the photo at top. The luminosity of the golden yellow Thai silk curtains and armchair is set off by browns and greys of the walls, carpet, screen and sofa. To the left, the original plaster of Caffieri's bust of the writer Jean de Rotrou, signed and dated 1781. The bookshelves are lined in green taffeta edged with a short fringe. 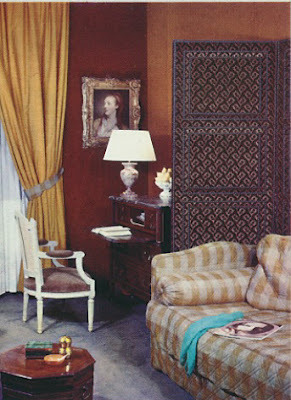 The sitting room-library has walls hung with cognac-colored material and golden yellow Thai silk curtains. Thai silk also covers the sofa in tones of warm grey and ochre. The Spanish-style screen is of dark brown, stamped velvet. 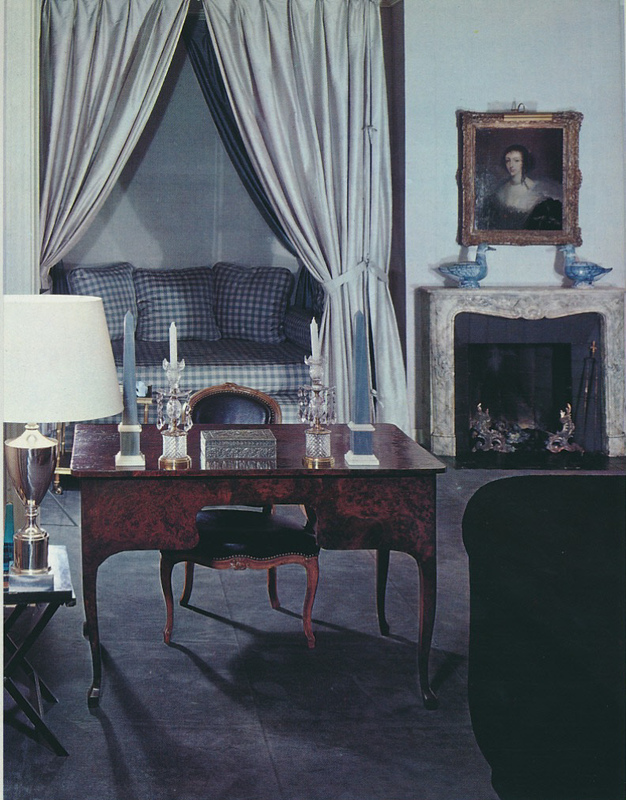 Next to the screen is a Louis XVI desk, and a small Louis XVI armchair painted white and upholstered in brown suede. Above them, a charming portrait by Greuze of a young girl. The octagonal table in the foreground is a George IV English wine cooler. Elephant grey carpeting. The entrance hall doubles as a dining room. Ingenious use of space creates the impression of a large apartment, but there are actually only three rooms and the entrance. The raw silk curtains are beige on one side and an extraordinary orange changing to yellow on the other. Six Louis XVI chairs are painted white and have black velvet tufted seats. The black lacquered table on steel legs can be folded up and rolled away. Against the wall, Louis XVI wall brackets. In the background one can see the library. The living room carries on the sober elegance and refinement of colour of the rest of the apartment. Beige walls, 18th century Tibetan rug of faded blue with a white design, sofa and armchair is natural-coloured heavy Thai silk. Small pillows in velvet printed like leopard fur. The curtains are in changing shades of olive green Thai silk. 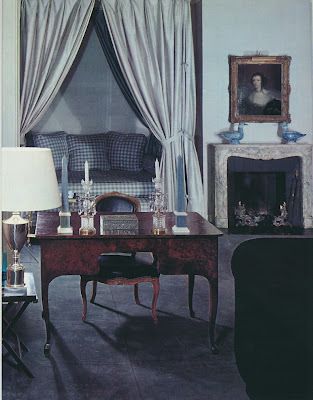 White Louis XV chair to the left covered in deep blue velvet. The magnificent Louis XVI vertical bookcases, lined with rust brown taffeta, and a desk that can be glimpsed on the right, are by the great 18th c. cabinetmaker Jacob. 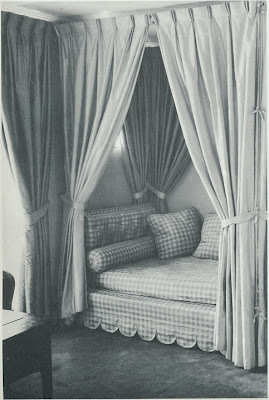 Detail of the bedroom. This room's character comes from the delicate, cool tones of the silks. Walls and the front bed curtains are in silvery grey; window curtains and the back bed curtains are in a deeper silvery blue. 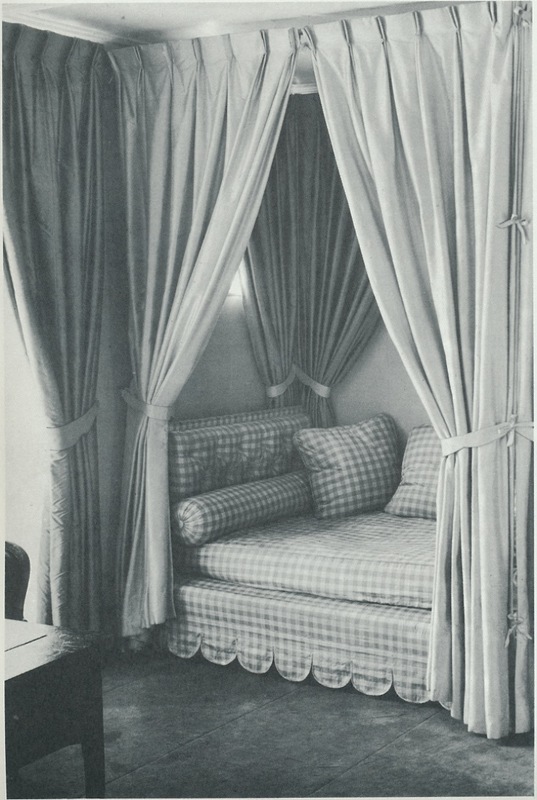 The checkered silk of the bed combines both colours. The quiet harmonies of grey and blue silks create a restful atmosphere. Over the Louis XV stone mantelpiece painted like marble is a portrait of Henrietta Maria, wife of Charles 1, by Henry Stone, a pupil of Van Dyck. 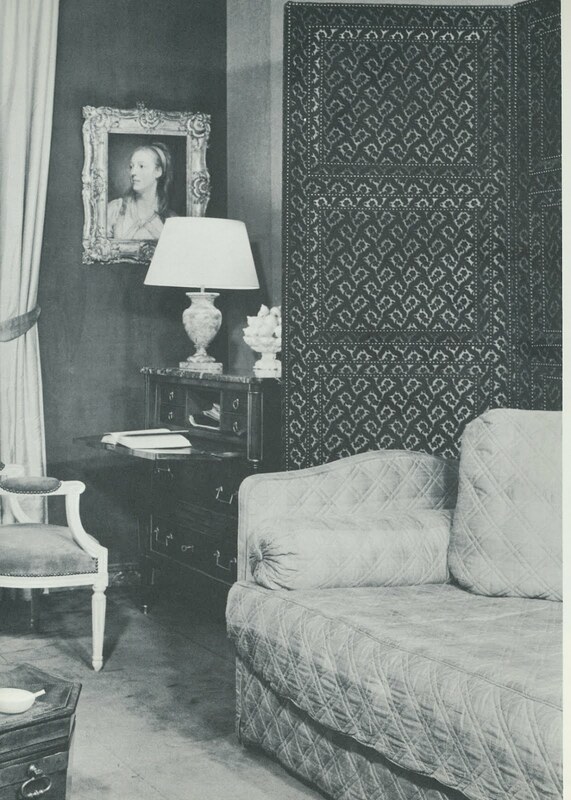 In the foreground, an English 18th century desk and a Louis XV chair upholstered in black leather. On the desk, a pair of 18th century English crystal candlesticks and a 19th century silver box found in Siam. All photos and text from The Best in European Decoration . Sometimes I look at black & white photos of interiors and imagine what the colors might have been; I would have guessed wrong here! But what an interesting change from the "safer" schemes that are shown in all the magazines today. Although it's a little hard to see, I love when the edges of bookshelves are trimmed with a fringe or embossed leather. A very nice touch. 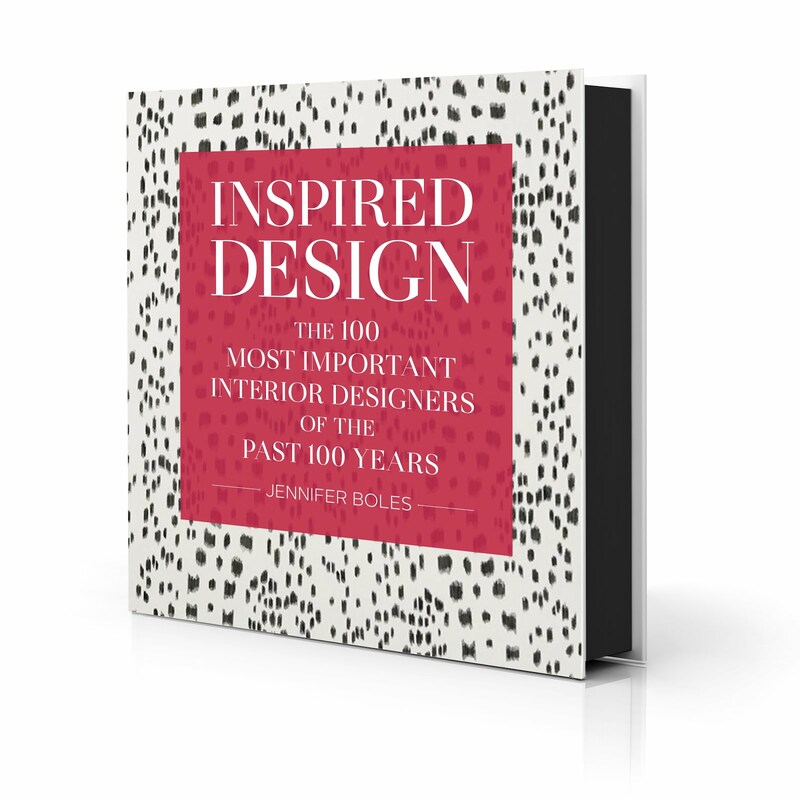 I wish there was a book on M. Geffroy, he's certainly the finest designer, if elusive, of his generation! As a professed "fabric whore," I swoon. Oh, that Georges Geoffrey. Wasn't he the best? I had no idea that Jimmy is related to Jim Thompson? I have been to that apartment and liked it and its residents, Jimmy Douglas and his partner, the late Roderick Coupe, very much. I interviewed them about a decade ago for a book I have been working on forever, and it still looks pretty much the same. So fascinating to find these photos. I had dinner at that apartment twice in the spring of 1989. Jimmy was one of the most gracious hosts, and a wonderful guide to Paris. And what a great conversationalist. I still have the volume of Mapplethorpe photos in which Jimmy's portrait is featured, a la Garbo. Chuck, How lucky you are to have seen the apartment in person. 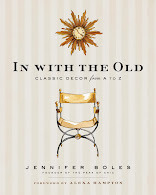 It looked so elegant and warm and the perfect home for a gracious host! The Renzo Collection from Currey & Co.
Is Green Acres Really The Place To Be?